Variable Action Heroes Past Blue Zoro Condition is Used. Dispatched with Royal Mail 2nd Class. 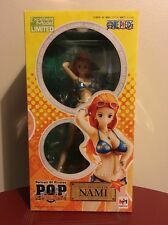 FIGURE ONE PIECE CREATOR X CREATOR NAMI 2 II STATUE BANPRESTO SPECIAL EDITION. ( OLD STOCK LEFT OVER FROM TRADING AT ANIME CONVENTIONS ). BOX SLIGHTLY DAMAGED. (Great quality and great size you will not be disappointed. We will dispatch as soon as possible ;). There's a small amount of sun fade on the top of the box as well (see photos). Stickers still on there (but moved). Size is 7 5/8. One Piece Anime Luffy Metal Anime Clasp Bracelet. Condition is Used. Dispatched with Royal Mail Signed For® 2nd Class. Love this but don't wear it anymore. Good condition! Offers welcomed. Need gone!! Price is NOT final. Make me offers. One Piece Omnibus Collection. all in great condition and have been kept on a book case in a smoke/pet free house. Model:One Piece Kaido. Size: 19cm. Luffy has a big wide grin and a scar on his chest while holding his flag. (One Piece Book Style Clock - Monkey D Luffy & Portgas D Ace version. 2) Log on to. Out of production and rare. Requires 1 x AA Battery (not included). Size: Approx 10.5 x 14.5 x 4.5cm when closed like a book. ONE PIECE Vinsmoke Sanji Battle Ver. We will try our best to give y ou a happy shpping experience. Material: PVC Size:about 17cm high. Like new condition , displayed for a short time and stored . The popular manga series “One Piece” was officially recognized by Guinness World Records as the comic book series with the most copies published by a single author. “One Piece,” which started out in 1996, has been one of the most popular and financially successful manga in the Japanese market. 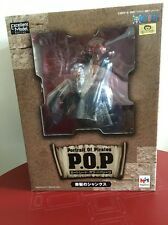 One Piece Gold Film Dxf Manhood 2 Gild Tesoro Craneking Banpresto. Condition is New. ( OLD STOCK LEFT OVER FROM TRADING AT ANIME CONVENTIONS ). BOXES SLIGHTLY DAMAGED. 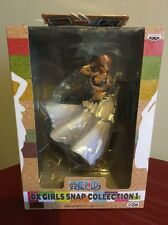 Originally bought on AmiAmi. This is NOT a fake. Box condition: B. His last words before his death revealed the existence of the greatest treasure in the world, One Piece. The popular manga series “One Piece” was officially recognized by Guinness World Records as the comic book series with the most copies published by a single author. The series began in the publisher’s Weekly Shonen Jump magazine in 1997. Japanese Manga / Anime Character One Piece, Tony Tony Chopper Cap / Hat. Condition is Used. Dispatched with Royal Mail 2nd Class. Made from soft velour type fabric. There are some light marks. Approx. 40cm x 27cm x 13cm. Detailed model kit (new, boxed and unused).